In this article, we will show you, How to write a c program to find GCD of two numbers using For Loop, While Loop, Functions, and Recursion. According to Mathematics, the Greatest Common Divisor (GCD) of two or more integers is the largest positive integer that divides the given integer values without remainder. For example, the GCD of two numbers in C i.e., integer 8 and 12 is 4 because, both 8 and 12 are divisible by 1, 2, and 4 (the remainder is 0) and the largest positive integer among the factors 1, 2, and 4 is 4. The Greatest Common Divisor (GCD) is also known as the Highest Common Factor (HCF), or Greatest Common Factor (GCF), or Highest Common Divisor (HCD), or Greatest Common Measure (GCM). NOTE: In order to find the Greatest Common Divisor or GCD in C, we have to pass at least one non-zero value. This gcd of two numbers in C program allows the user to enter two positive integer values and we are going to calculate the Highest Common Factor of those two values. Next, using the For loop it will calculate the GCD in C.
First printf statement will ask the user to enter two positive integer values. For loop will resist the i value, not to exceed the user-specified values. In the next line, we used the If Statement to check whether the remainder of Num1 % i and Num2 % i equal to zero or not. 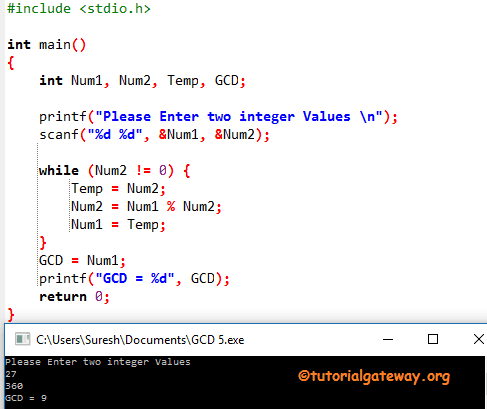 This GCD of two numbers program in c allows the user to enter two positive integer values and we are going to calculate the Greatest Common Measure of those two values using the While Loop. In this gcd program in c program, within the while loop we are checking whether the second value is not equal to Zero or not. If it is zero it will exit the while loop otherwise, it will start executing the statements inside the while loop. This gcd program in c allows you to enter two positive integer values. Next, we are going to calculate the Greatest Common Measure of those two values without using the Temporary variable. This program for gcd of two numbers in c allows the user to enter two positive integer values and we are going to calculate the Greatest Common Divisor of those two values using Functions. This gcd of two numbers in C program allows the user to enter two positive integer values. Next, we are going to calculate the Greatest Common Divisor of those two values by calling the function recursively. Please refer Recursion for further reference. In the above-specified function, return gcd(y, x % y) statement will help the program to call the function Recursively with updated value. If you miss this statement in C gcd of two numbers program then, after completing the first line it will terminate. Let’s see the If condition in gcd of two numbers program in c. Here, if (y == 0) will check whether the number is equal to 0 or not. For Recursive functions it is very important to place a condition before using the function recursively otherwise, we will end up in infinite execution (Same like Infinite Loop).